This is the most popular dish in Nepal. Might I dare to say, it’s a national food of Nepal. 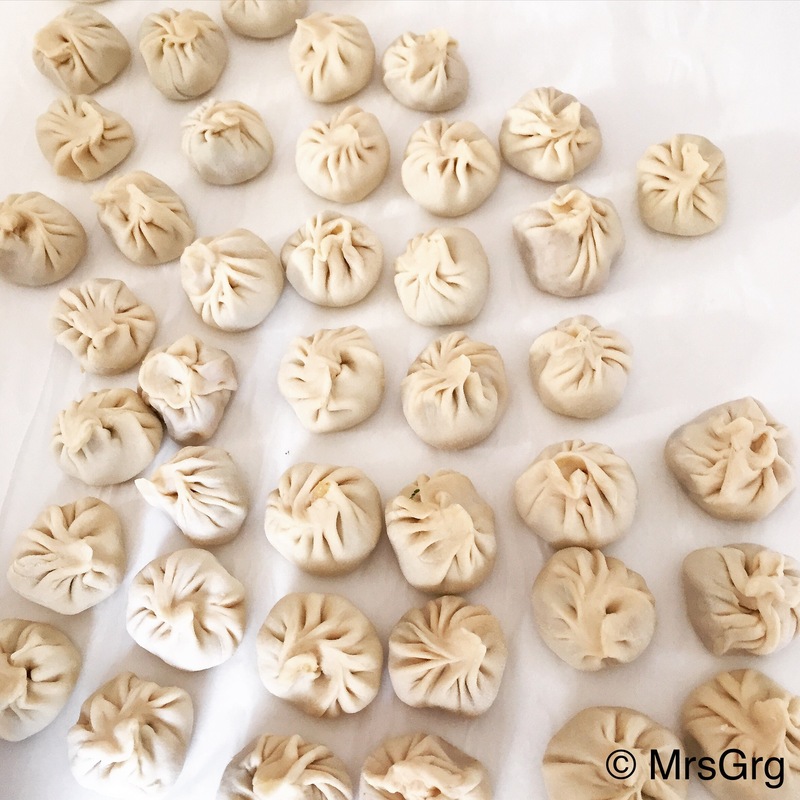 Nepali dumplings are unique in its own way. It’s more spicier with juicy filling of ground buffalo meat. It’s served with a spicy tomato achar (sauce). 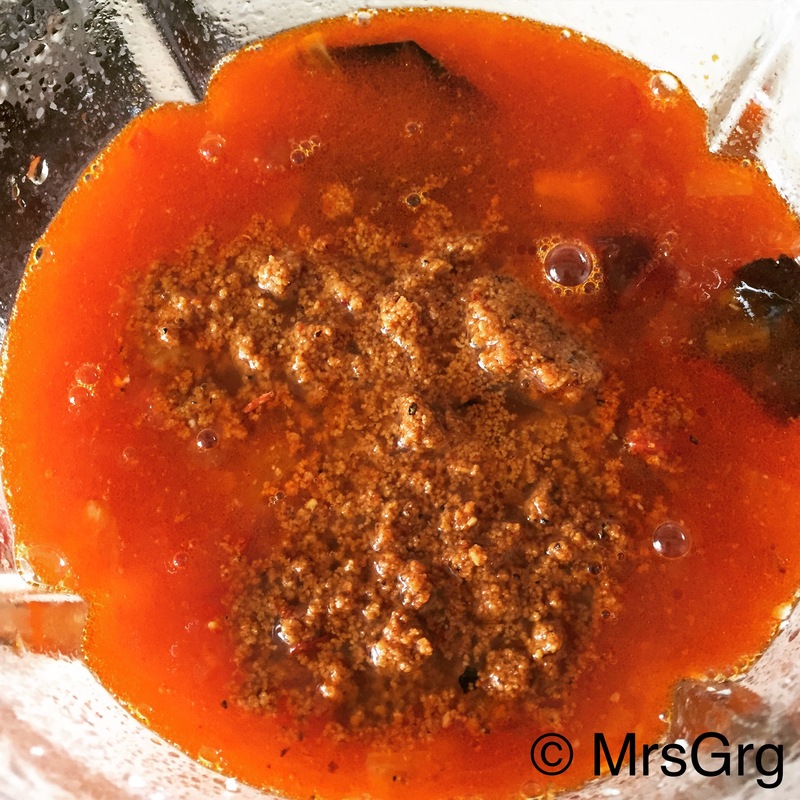 There are few types of tomato achar that is served with momos. In my last post, I shared a recipe of a jhol achar, which is most common in Kathmandu. 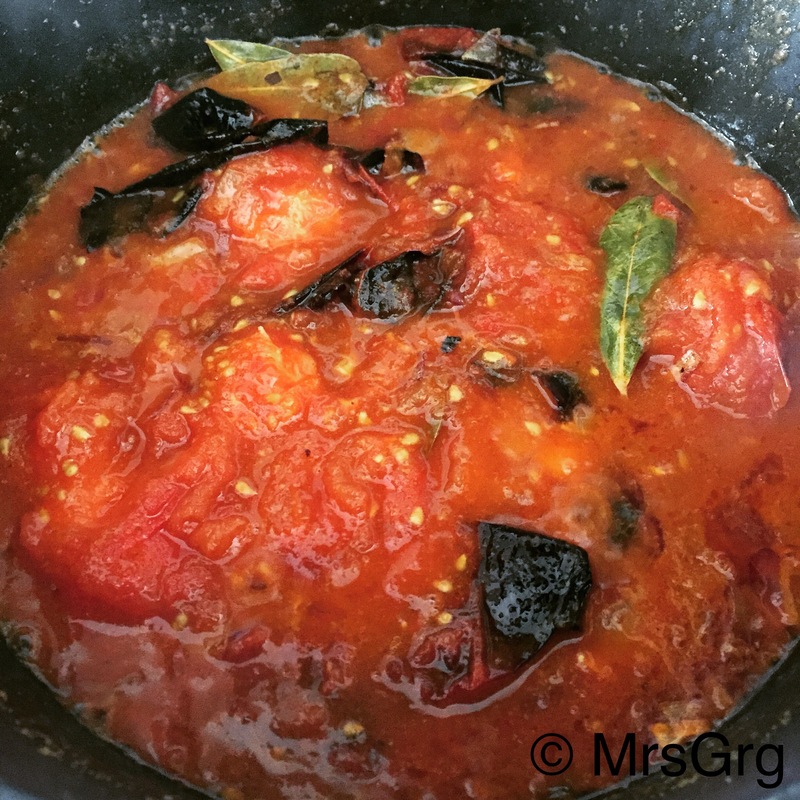 Or you can make a simple tomato achar (Golveda ko achar) that I’ve posted few months earlier in my blog. It’s also served with a side dish of chicken soup broth made with chicken bones. You can rarely find a Nepalese who doesn’t like momos. As one of my Instagram friend said (quote) ‘it’s stamped in our DNA and I cannot agree more.’ (Do check my Instagram @mrsgrg2014 to explore Food gallery and videos). We eat momos almost every week, be it family gathering or just a snack or dinner. It’s easier to make if you use premade store bought wrappers or skin. It can be found in Asian grocery stores. However, I prefer home made wrappers. It’s bit time consuming and need a bit more labour but the end result is worth the time and effort. 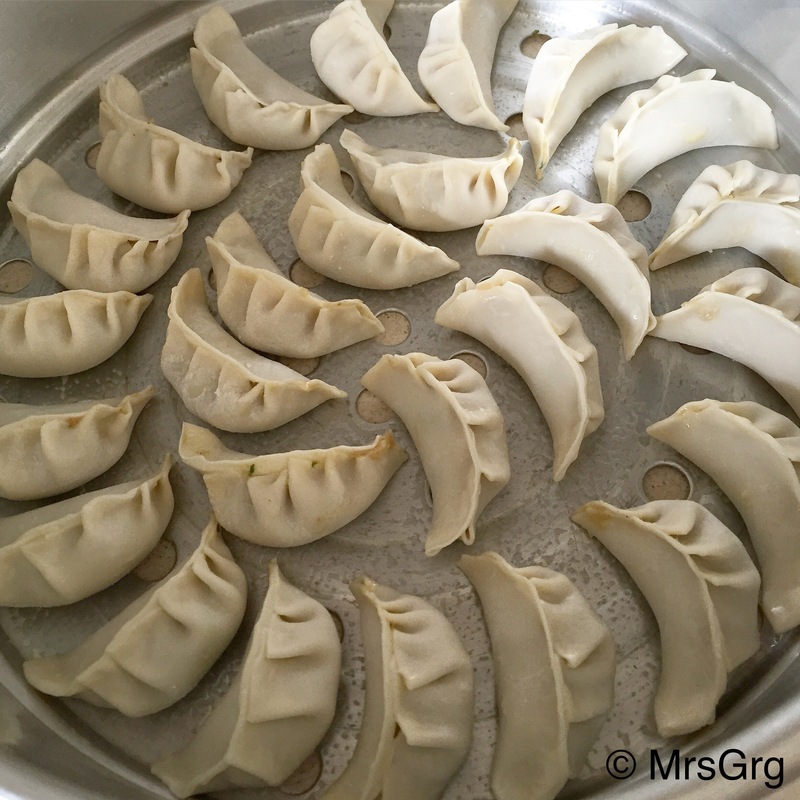 If you are trying you hands on making momos for the very first time, I suggest use premade wonton skin. 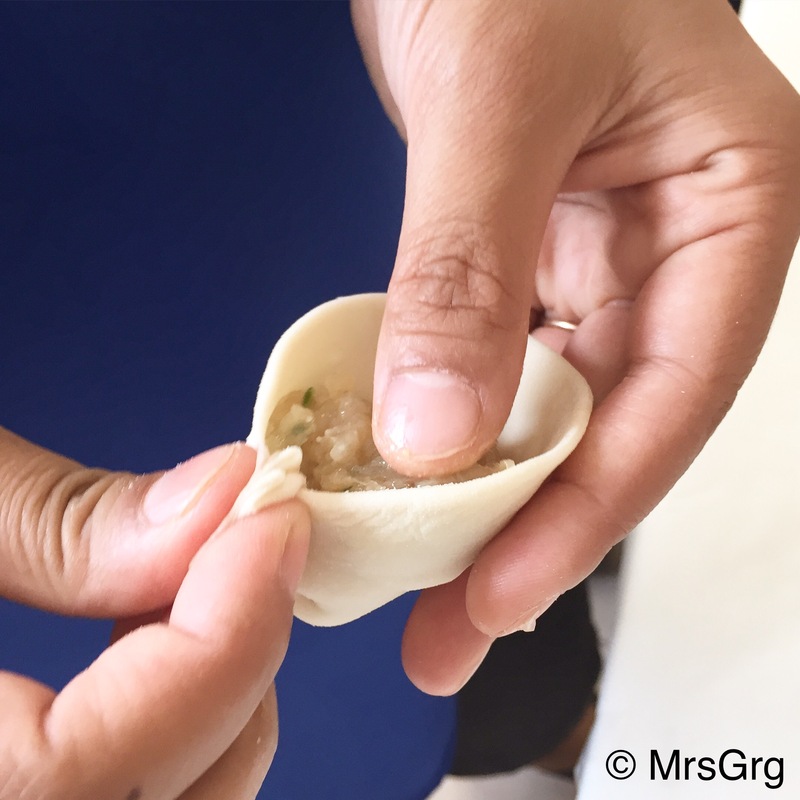 As there are lot of elements required to make momos, you just don’t want to be too overwhelmed. However, if you choose to make your own wrappers, make it a family affair and get everyone involved. 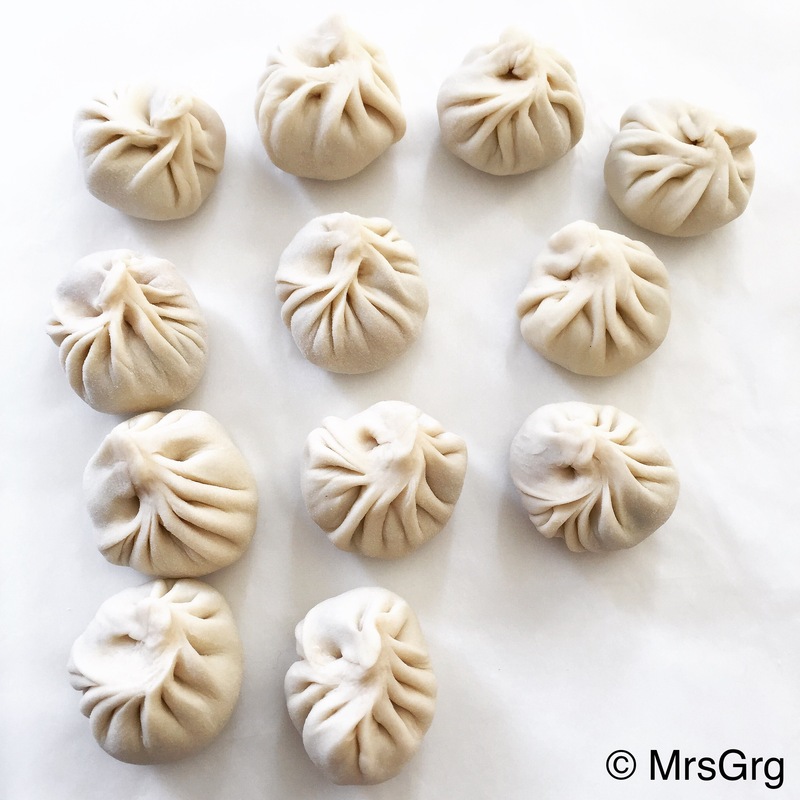 Here’s my recipe for Momos. I made this for my family gathering. 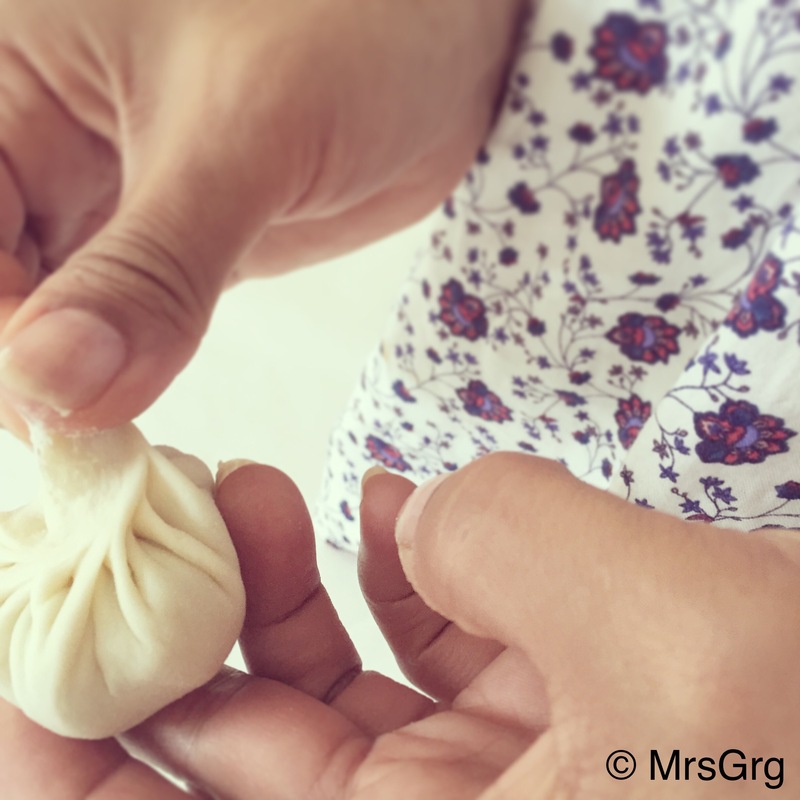 This recipe yields about 120 momos with homemade wrapper. 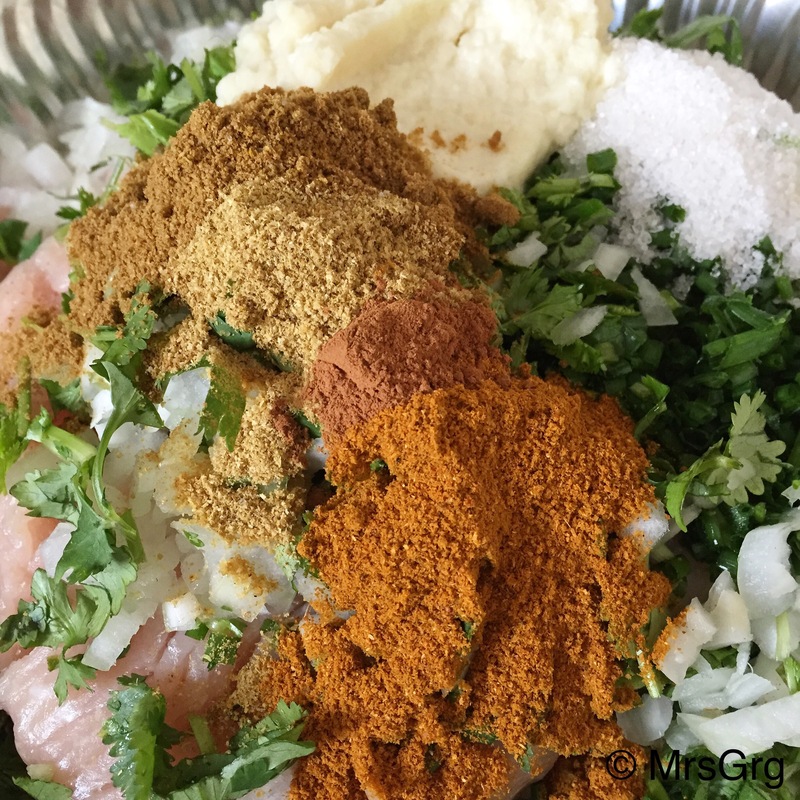 Please reduce the quantity of spices and other ingredients in half or quarter to suit your need. Also you can tone it the spicier as per your liking. If you end up with too many momos, don’t worry. You can always freeze them, it lasts for a month. When cooking frozen momos, don’t defrost it. Put it straight in the steamer on top of boiling water and steam for 15 minutes. 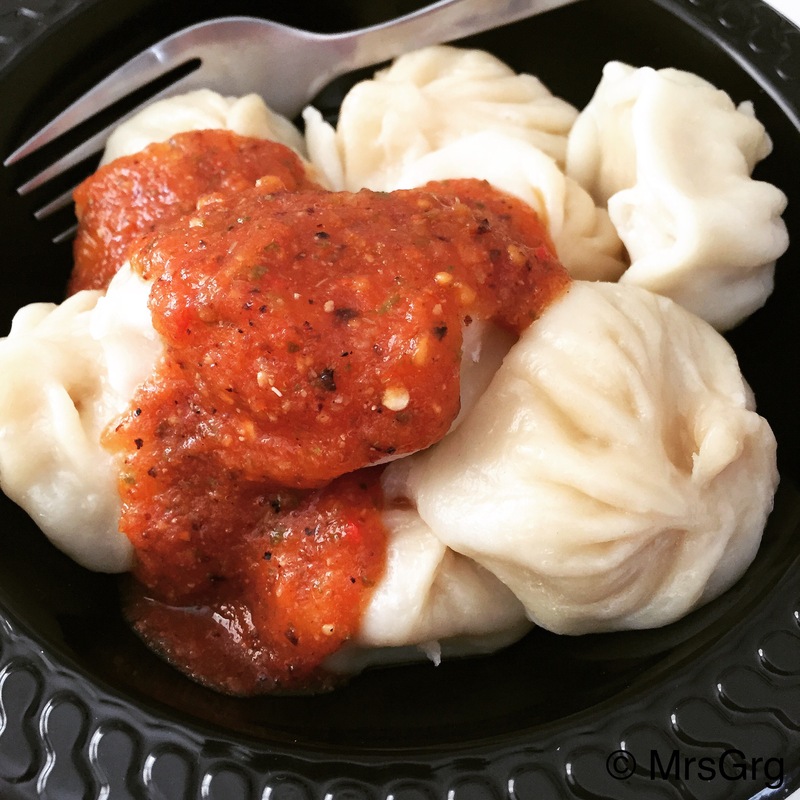 You can enjoy steaming hot momos in no time. Sift flour into a big bowl. Make a well in the centre and add water. You can use fork or fingertips to slowly mix flour with water. When it all comes together, get your hands into it. 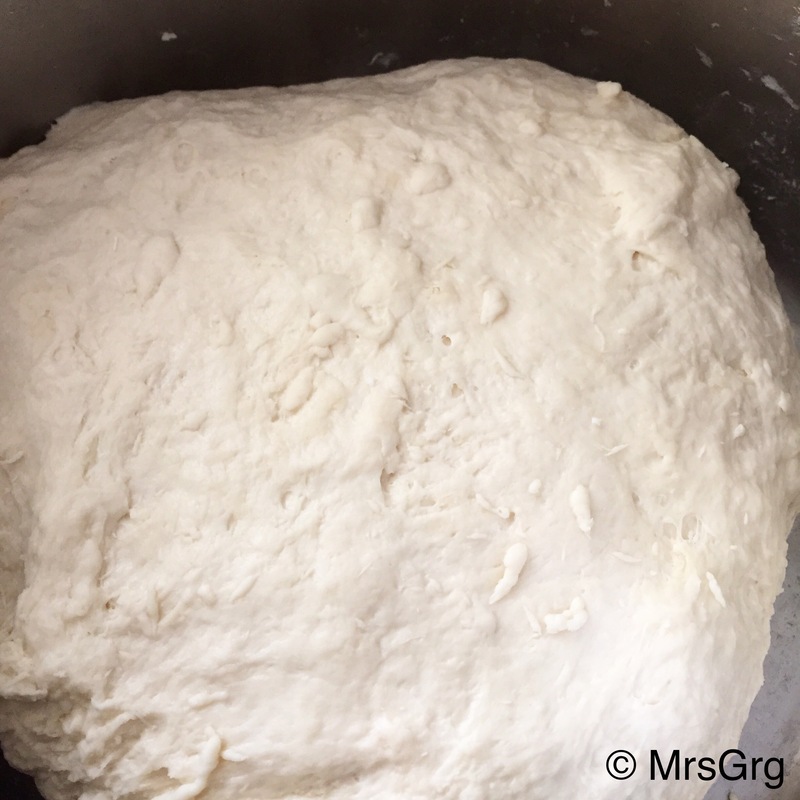 Mix and until it all comes together and knead it into a smooth dough. Tips: If dough is not coming together and very flaky, add more water little bit at a time, until it knead into a ball. If the dough is too watery of soft, add bit more flour to make it a soft but firm dough. When dough is ready, it should leave the side of your bowl and hands too. Cover the bowl with a wet towel or a cling wrap and set aside. 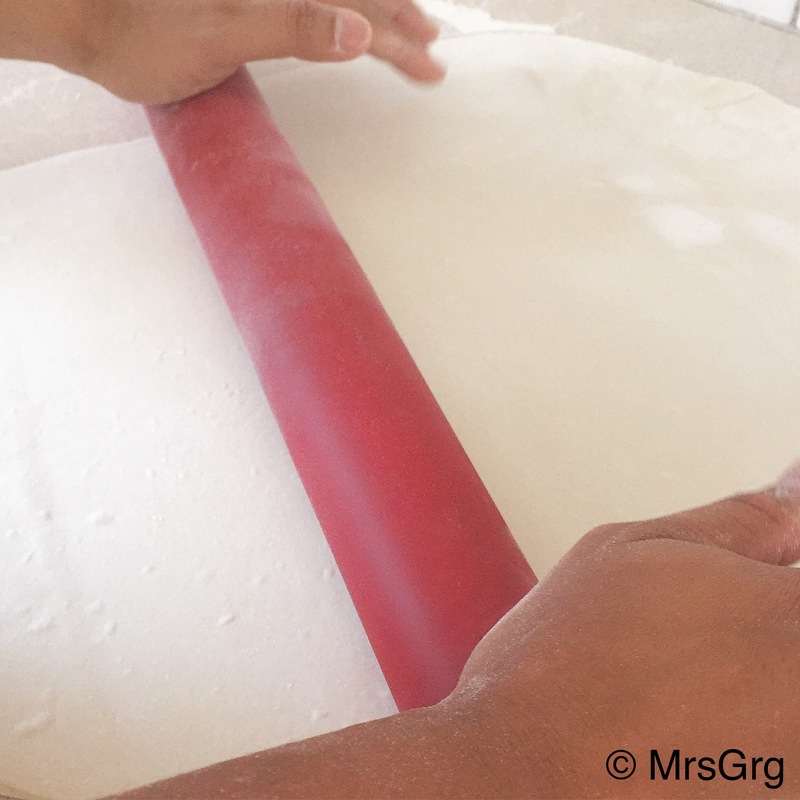 This helps to soften the dough and making it flexible and elastic to work with. Leave it for at least half an hour or more. Do not let the dough dry out, or it will be hard to work with. 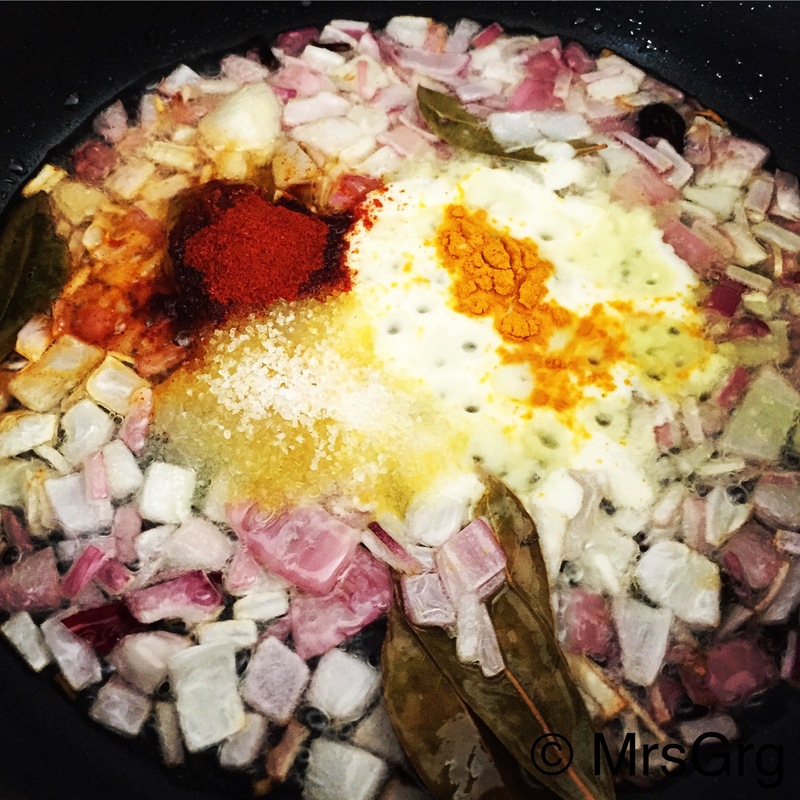 Put meat in a large bowl, add all the ingredients, spices, water and oil and mix well with mince meat. Set aside. 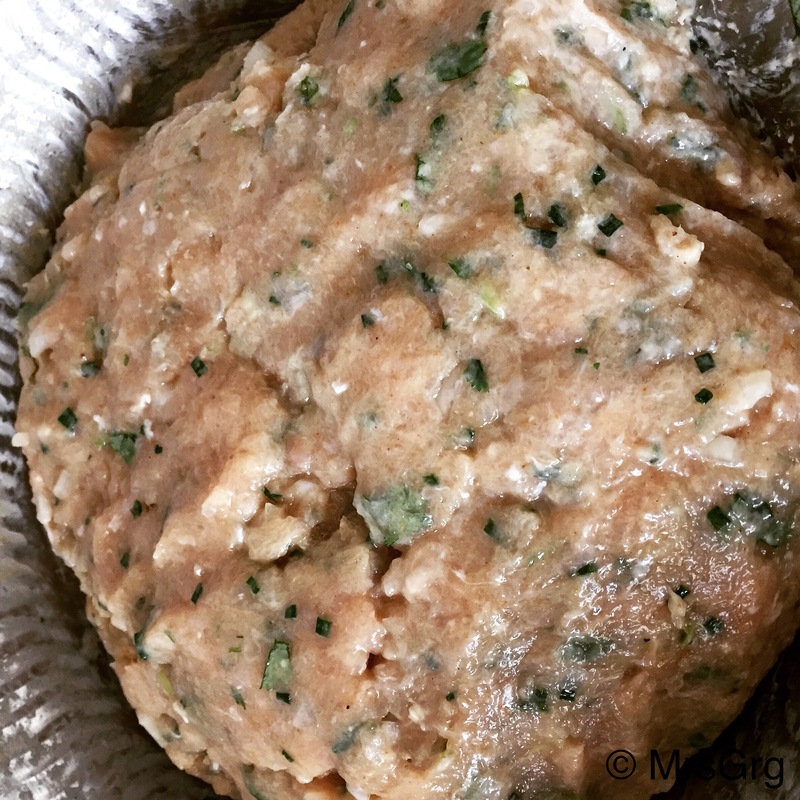 Note: You can add finely chopped cabbage to the mix to make it more juicier if you are using lean chicken mince. Take a handful of dough and roll it into a ball. Dust the flat and dry (clean) kitchen bench with flour. Place the ball on the surface and flatten it with a rolling pin. Roll it out quite thinly. 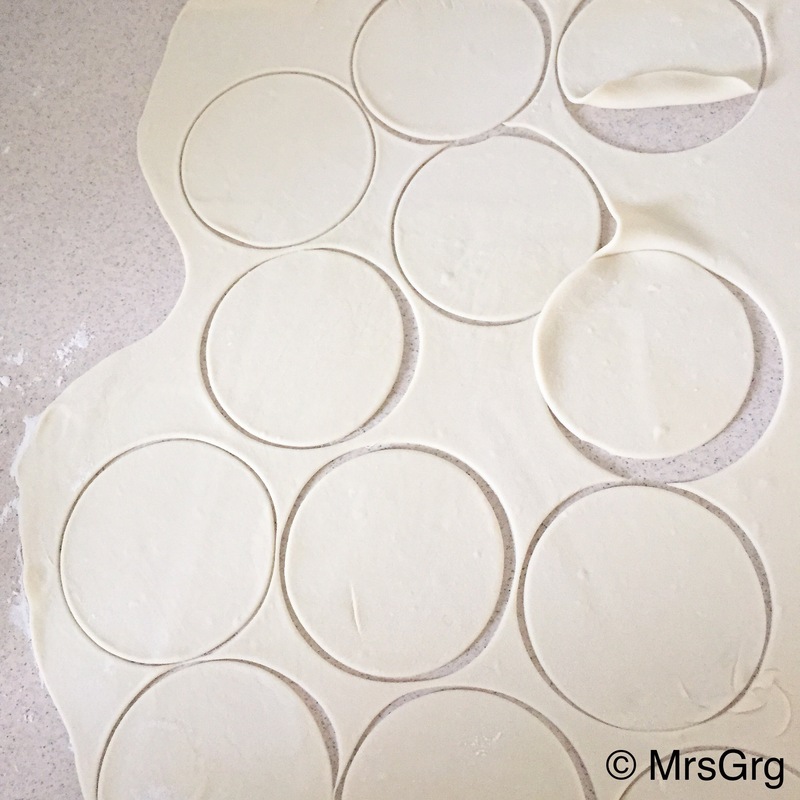 When it’s as thin as desired, get a round shape cutter and cut out as many as you can. Repeat the same process to make as many wrappers as required. Here comes a tricky bit. There are few shapes you can make. 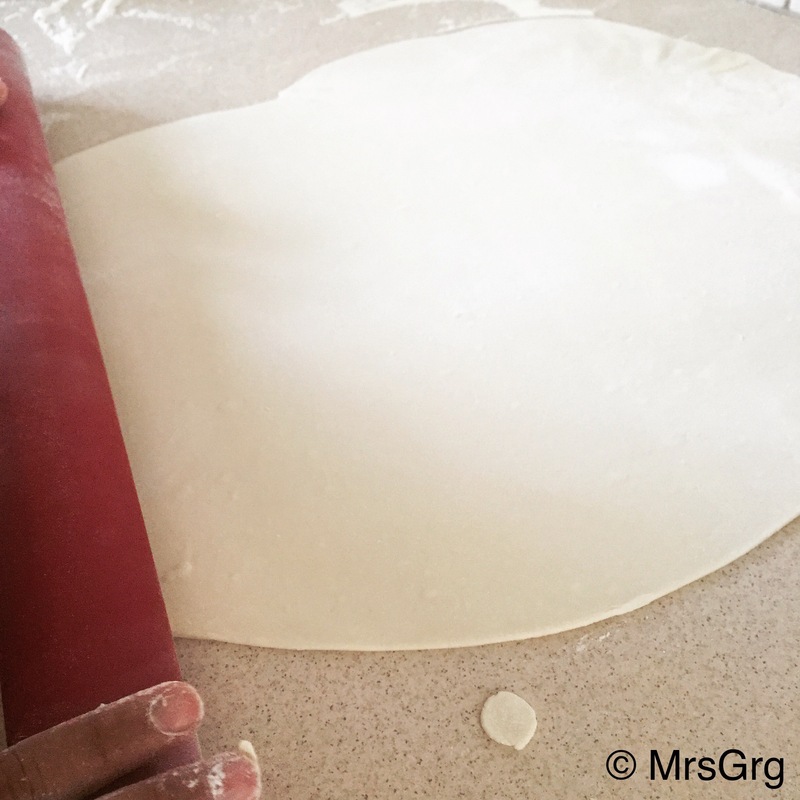 For round shape momos: place a spoonful of mince mix in the centre of the wrapper. Hold the wrapper on your left hand . Pinch one side of the wrapper for first crease with your right thumb and index finger. Then just pinch and stick second crease with your index finger. Continue pinching around the circle little by little, keeping your thumb in place, and continuing along the edge of the circle with your index finger. When you come a full circle, stick the end together to seal the momo. Oh how I wish I could load the video. So much easier to show a demo. However, I’ve seen a video floating around showing how to shape dumplings. If this is your first time making momos, please do check out the video. Here’s the photo of wrapped momos. The hard part is over. Now this is a easy. In a momo steamer, boil water on the bottom pot. Grease the top container (one with small holes) with oil. 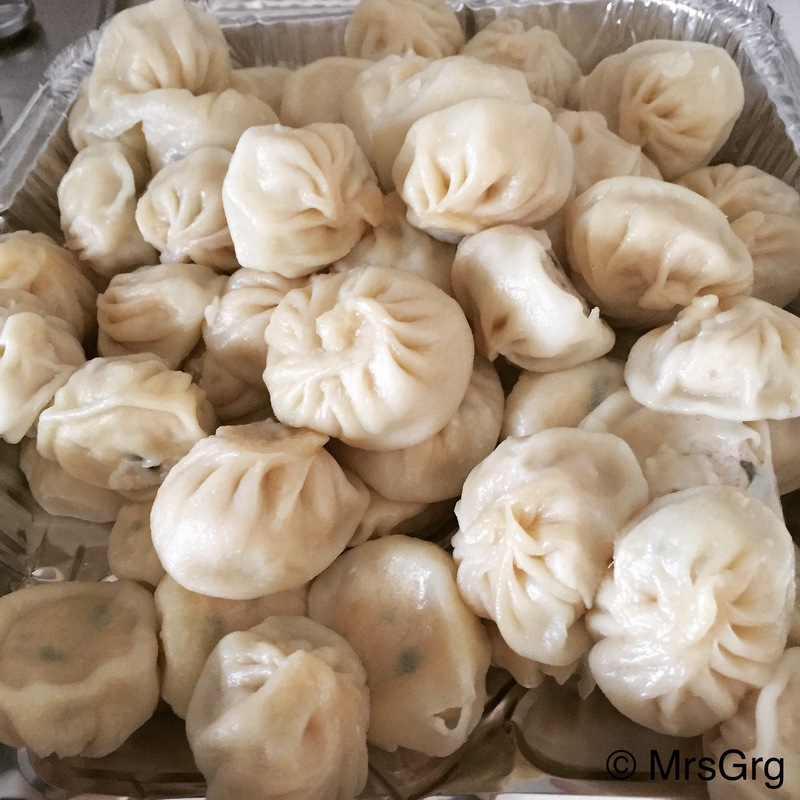 Place the momos until the container is full ensuring momos are not touching each other. Place this container on top of the boiling pot and cover with lid. Steam it for 10-12 minutes on a medium heat. 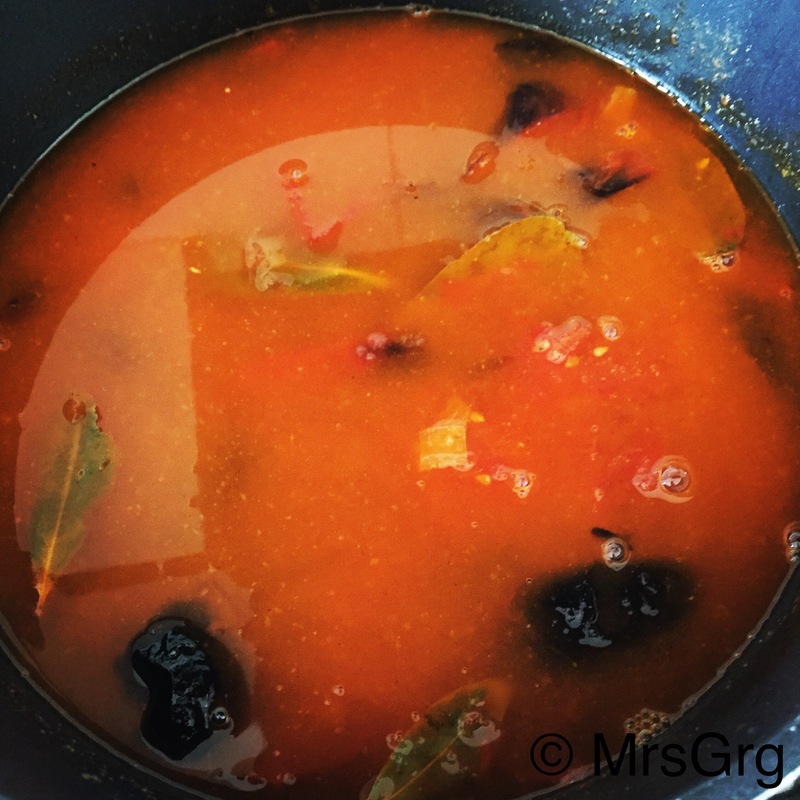 Serve hot with a jhol achar or tomato achar. Please do try it. It’s best served hot on cold winter days. Happy Cooking. Jhol momo is very famous and much loved steamed Nepali dumplings served with jhol achar (soup). It is an easy find in any restaurants and street hawkers in Kathmandu. The jhol achar is in house specialty of momos that you get in Kathmandu. As I was born and raised in Kathmandu, I grew up eating momos for khaja (afternoon tea) almost everyday. 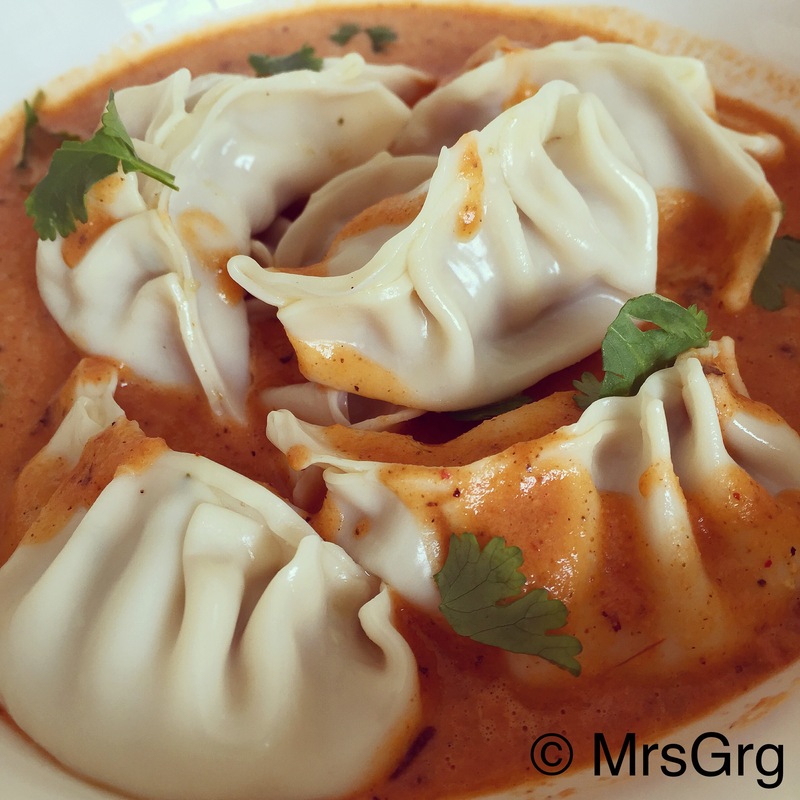 These momos came swimming in a liquid (tomato soup) laced with powdered soya or sesame. This is perfect accompaniment for momos as this soup enhances the meatiness of the dumplings and also gives it a nice kick of chilli and tanginess. Depending on the kind of eateries, the taste and consistency varies. It was not always the healthy choice if you buy it from local eatery as they normally use lot of fat in the mince meat, but it sure was very tasty. Every now and then I crave for this authentic taste of jhol momos. I make momos at all the time, be it for dinner, or for family get together, momos always gets a nod. I’ve been trying to recreate this jhol momos for a while now. 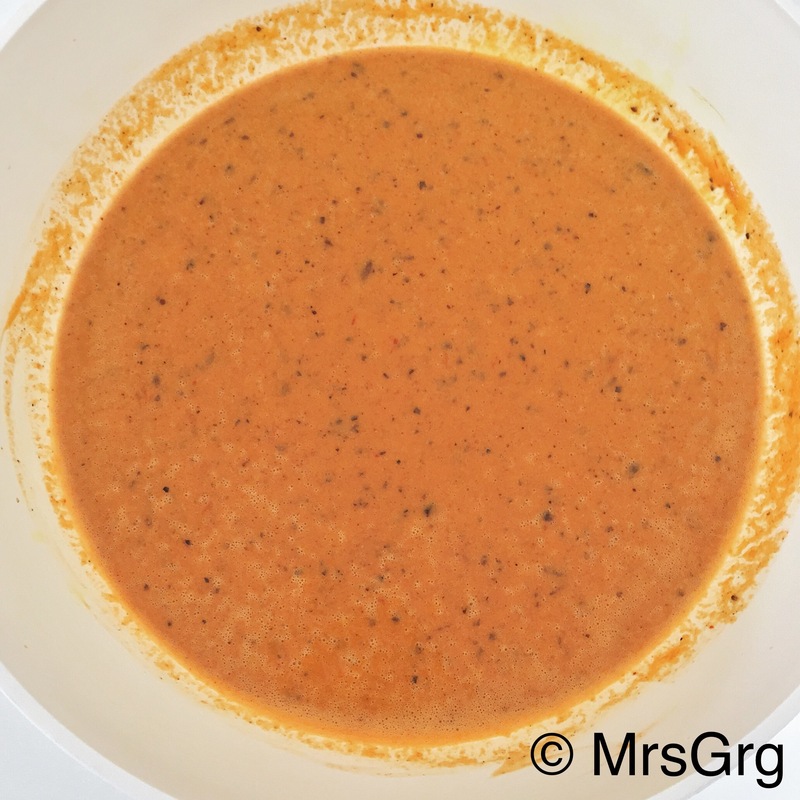 I’ve tried few combinations of spice and consistency, it’s been a hit and a miss. But the recipe of the jhol (soup), I’m about to share comes very close to the authentic taste. When I tasted it, it took me straight back to those steaming stalls of Kathmandu street. 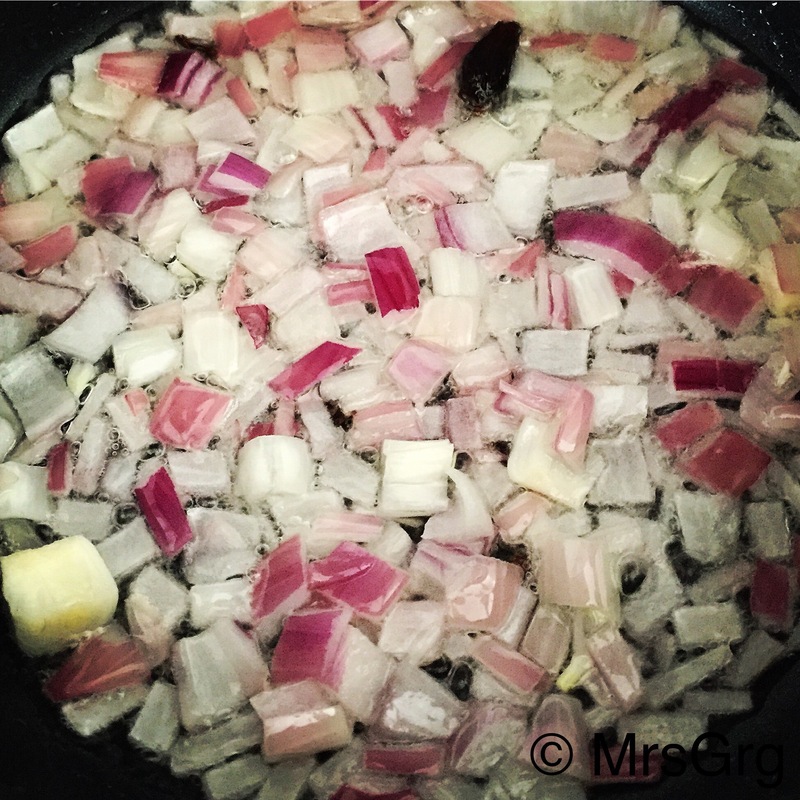 In a pot, heat oil and fry onion until soft and has slight colour. 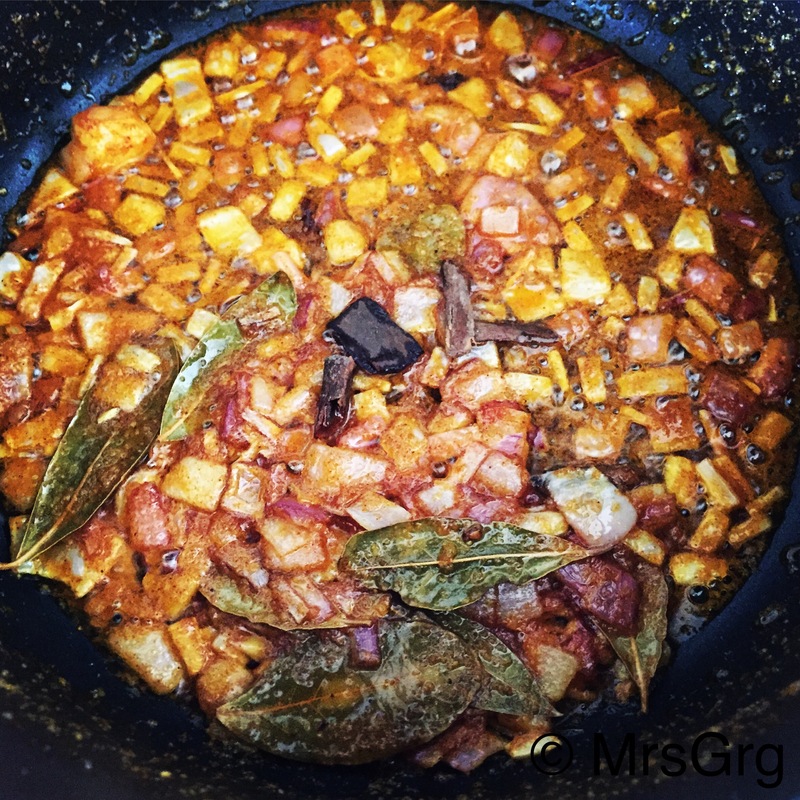 Add cardamom, cloves, cinnamon stick, bay leaves and let it infuse with sautéed onion for a minute. Add garlic/ginger paste, turmeric powder, salt and chilli powder. Fry it for a minute or two, till oil seperates. 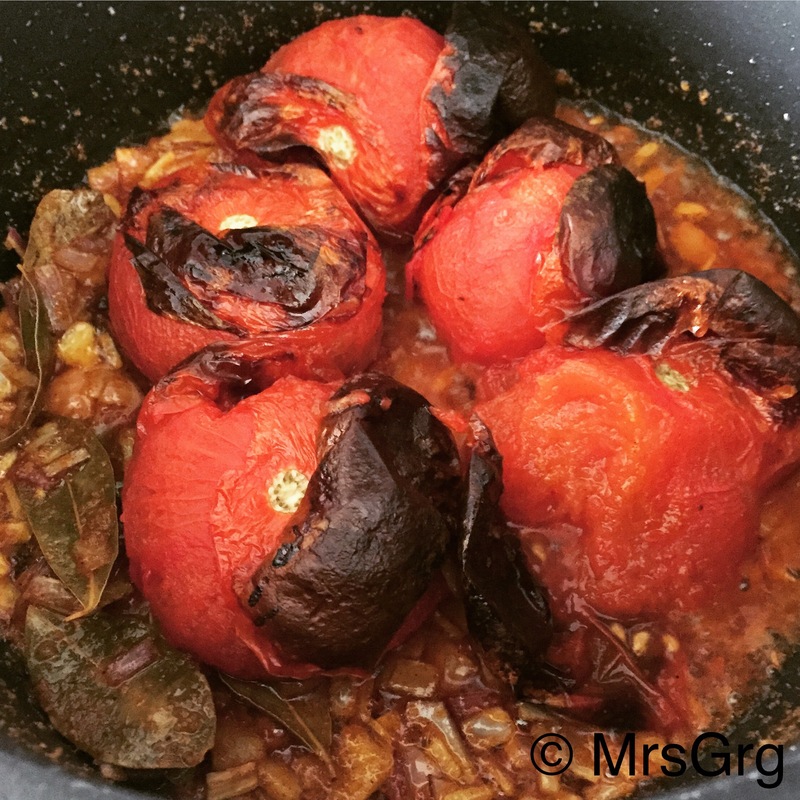 Add roasted tomatoes and cook until for 5-7 minutes by covering the pot. When tomatoes are soft and mushy, add chicken stock and bring it to the boil. Turn the heat to low and let it simmer on a gentle heat for 10 minutes ensuring the liquid doesn’t reduce. After 10 minutes turn off the heat. Let it cool. When the soup is cool, take bay leaves, cinnamon, cloves and cardamom out of the soup. 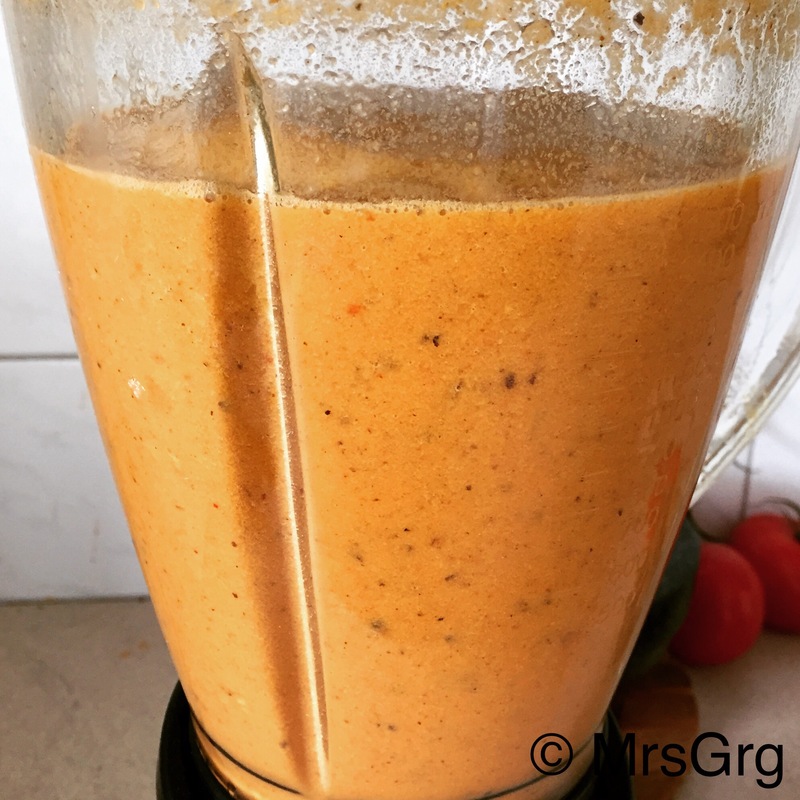 Pour the soup in a blender and add sesame. Blitz it until it’s creamy and fine. Serve it with steaming hot momos. Enjoy.